There’s been tea. There’s been talk. And walks, lots and lots of walks. Other coastal Quine walks have already been documented: Crovie (where we got lost in a pea field) and another day when we searched for Lord Pitsligo’s Cave. The Lake at Pitfour Estate was nice and mellow, the old Temple of Theseus thankfully no longer housing crocodiles! Sometimes social media isn’t all that social; it can be taken over by constant ads and spam and passive aggressive Facebook memes. But good things happen too. I deeply appreciate the caring and non-demanding friendship of The Quines. I value many others I’ve got to know along the Twitter path too. So take a minute. Listen. Laugh. Tap those screens and sit and chat. 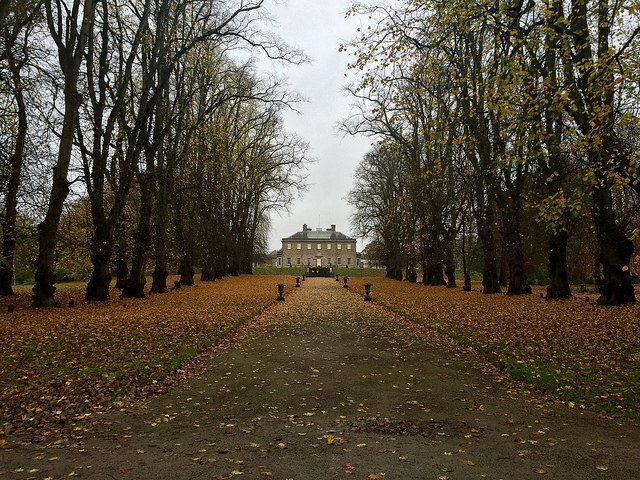 The first picture in this post was of Haddo House; the one above was taken in the country park there too. 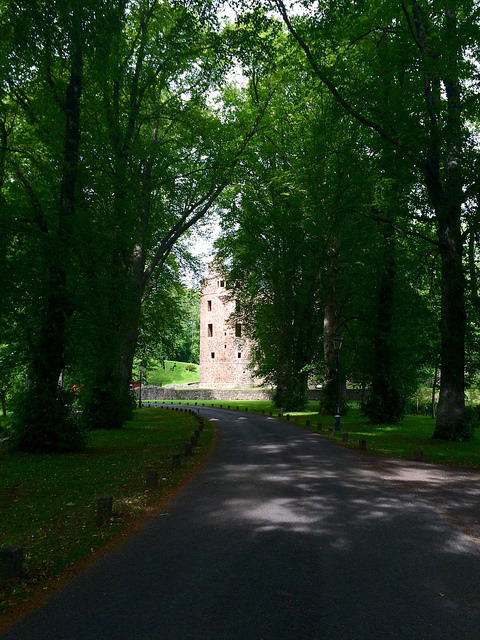 This entry was posted in green places, life and tagged Autumn, beach, castle, history, ocean, river, Scotland, stone circle, summer, tower, trees. Bookmark the permalink. Beautiful pictures and lovely to hear a really positive story of the power of social media. Glad you enjoyed it Alys. No place compares with Scotland in terms of walking/hiking. I wish I could visit every single year. Wish I lived there! The cold is worth it! Gorgeous, Ailish! Wish I could go with you. Remember saying to you long time ago, your better than any tourist information, still true. Temple of Theseus is still a potential ” Cake by the Lake”. I love hearing about friendships and connections made online. I’m old(ish) so this is all new territory. Heartwarming, Ailish. It’s exactly the kind of connection social media promised – and you’re living it. And the light of the sun is shining brightly in (almost) every one of your lovely photos. We are quite lucky with the sun, except on the pea field day when we got drenched! Your photos are wonderful, magical. A Twitter friend of mine (from Scotland!) taught me the word “quine” just the other day. Of course I’m going to share this with her. Thank you. Just came across the word quine in a novel I’m reviewing next month. Great to hear of your walks with real ones! Quine is a great word, isn’t it? I’ll have to look out for that review! Cruel woman. I’m sitting in a south London supermarket and see this. Why am I not in Scotland? ! If you do and want to share a stroll let me know! As ever you lead a life I wish I could. As always, a delight. Your photos transport me to another place and your words soothe and tickle as if we were truly on an adventurous stroll. Beautiful. So happy to have made your social media acquaintance, dear one! I’ve just completed Coast Road 500 and enjoyed looking at your photos. Scotland is so inspiring, whatever the weather. Absolutely love this, and I’ve discovered so much about my local area I didn’t know existed social media can be a curse or it can be a wonderful place to connect, I’ve “met” some fantastic people through blogging & made friendships that I treasure (even if probably won’t get over to Belgium to meet one of the dearest of people). Such beautiful photos. I’ve lived in Aberdeenshire for 30 years and I’m still stunned by the amount of atmospheric places i’ve not yet been to. Love your photos. You certainly have some beautiful scenery to stroll in. I can’t complain though, since I look out my window and see the beautiful Oquirrh Mountains which are covered in snow today. I live in Utah, but love to travel and Scotland is on my short list. Ooh, the Oquirrh Mountains sound beautiful! Most beautiful photos! And lovely post. Thank you for visiting my blog and following. I’m very glad to have found yours too. I’m glad you like the photos; I look forward to reading your posts too!